We loved Blessed Memories. We were off the beaten path, but still very close to all of the places we came to experience. The cabin was very clean and had plenty of space for our family of 5! The only small complaint was that the dart board was not real and the darts provided did not fit in the board. Other than that we would enjoy coming back to Blessed Memories for another stay! Beautiful cabin, great price and can't wait to book again! We really enjoyed our stay. The cabin was relaxing and comfortable. Only problem we had was the hot tub was not filled and the back door is impossible to close. We will be back though! We really enjoyed Blessed Memories (decorated nicely for Christmas!) so much that we want to stay there again (maybe this summer?) CabinsUSA is a great rental company ... from booking to arriving to check out, it could not have been easier ( I highly recommend express check in-check out). The cabin has all the amenities we needed (full kitchen, wifi, onsite laundry, hot tub) so we were very happy and comfortable. The only drawback would be the road to the cabin...it is steep and narrow, and it is a bit bumpy but one must remember that it is in the mountains and not a main road. Our son drove up to the cabin in his car, and he experienced very little issues with the road. Also would like to say that this location is close to all the action but is actually quiet/peaceful. Overall this rental had what we needed/wanted and look forward to staying with CabinsUSA again soon! Cabin was great! The only con was the driveway up to the cabin had pot holes. Wooded view only, easy to find, conveniently located off Dollywood Lane area and approx. 10 minutes from Parkway. The express check-in option was a benefit, allowing us to drive straight to the location after several hours of driving. Cabin was "tidy". Detailed, cleaning attention to the dust webs hanging from ceiling, kitchen cupboard panel fronts (food), baseboards, etc. This cabin is equipped with the bare minimum. 3 night stay and just enough towels for daily showering, not for hot tub or sauna use (no extras). You'll need to take your own TP for bathroom and dishsoap/dishwasher soap, salt/pepper, etc for kitchen use. Hot tub adequate, but like any other cabin stay we've been in, the hot tub rarely functions to full use (most jets/lighting doesn't work, parts broken) This particular cabin served us adequately and didn't affect our stay here in the Smokey Mountains! The cabin is so much more than what the pictures show. It's absolutely beautiful!! The cabin has tons of room. We enjoyed every single thing about it. We sat in the hot tub every night and watched the fireworks from Dollywood. We enjoyed the view from the top and lower deck. The views are amazing and we couldn't have asked for a better one. There were other cabins around us but we never saw or heard anything. It was so peaceful and quiet. I'm always a little hesitant about booking without knowing anything about the property but the Blessed Memories cabin was more than we could have asked for. I would definitely recommend this to anyone. We drove 17 hours to get there and it was worth it. The drive up to the cabin is not what other people have mentioned. It's a little steep but that's what you have to do to get to something this pretty! The place was nice the back porch and hot tube area could have been cleaner but over all it was nice. Cabins USA were very easy to work with and was able to do everything online. The only complaint i have is the road leading up to the cabin is very poorly maintained. There were many large potholes and VERY uneven concrete in many places. Not good for a low profile car. The cabin was clean and the location to the Parkway was great. I would definitely book with Cabins USA again. Cabin was comfortable and had plenty of room. 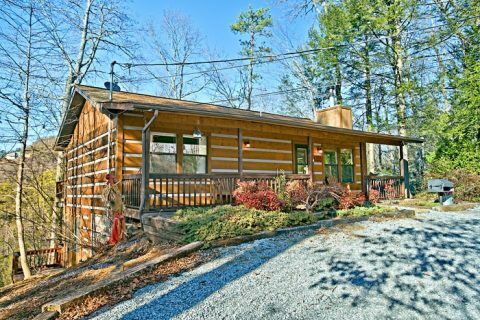 Good location, access to Gatlinburg via back roads is a plus. Only complaints is the hot tub had a lot of dirt/debris in it, it needs drained and cleaned. I added water to it because the water level was so low the pump was cavitating (I own a hot tub myself, so I have experience using/maintaining them) . Every single dart for the dart board was broken ☹️. The sleeper sofa was nice for our two youngest kids however the couch itself (when folded up) is very very uncomfortable, we tried to have a "movie night" but the couch was so uncomfortable we just couldn't settle in to watch the movie. You cannot use the jacuzzi with hot water. A jacuzzi that large would need an on demand hot water heater. These are all minor complaints/suggestions. The Cabin was very clean and we had everything we needed for our stay. The check-in/out process is very effecient and easy. I would stay again. Very beautiful cabin very clean. Had an amazing time here . Location was close to everything. Called first thing we we realized the hot tub wasn't working and they sent maintenance right out. Love the back porches so relaxing. The Blessed Memories cabin was awesome. I had exchange students with me and they were so impressed with everything the cabin had to offer. The games that were in the cabin gave them hours of enjoyment. I loved the easy check in and out. Thank you!! I am so happy to hear that you enjoyed your stay in Blessed Memories! We here at Cabins USA work hard to make sure each of our guests have the best stay possible while vacationing in the Smokies. When you are ready to stay with us again, please mention you are a return guest for an additional discount. Thank you again for your review and thank you for choosing Cabins USA! My cabin experience was everything I expected plus more. I loved the upgrades the new owners are doing such as flooring and entertainment. The hot tub was excellent and we loved playing pool. The view was great and I loved the fact we were minutes away from everything. The mattress in the master needs to be replaced but that was the only complaint for my entire trip. The cabin was semi-private but it felt private because we never saw or heard anyone else. Overall wonderful experience will definitely stay here again. Tip:The drive up is steep so you may need something with a little power. I am so happy to hear that you enjoyed your stay in Blessed Memories! We here at Cabins USA work hard to make sure each of our guests have the same great stay you enjoyed while vacationing in the Smokies. Thank you for letting us know about the mattress. Your comments have been forwarded to our Owner Liaisons who will be bringing this to the owner's attention When you are ready to stay with us again, please mention you are a return guest for an additional discount. Thank you again for your review and thank you for choosing Cabins USA! You will need a 4-wheel drive vehicle if visiting this property in the winter. The bedspreads and pillow shams need washed. I washed the blankets in the closet so we could use them. Also, don't forget to bring your own pillows. The staff was great from online booking to check-in, to the repair of the hall light we needed. They were very friendly in calling into maintenance and came out quickly for our hall light needs. the Pros: The view is gorgeous from the upper and lower decks, the cabin provides the perfect level of privacy (it is classified as semi private) as we were near other cabins but never even heard or seen them at all. I love the grill area in the front and the picnic table down to the right of the front door. Loved the porches and rocking chairs of the front porch and the swing in the back porch. Loved the sauna and the hot tub and that the cabin came with the option of being decorated for Christmas. Lastly, the supplies such as pots and pans were of nice selection and suited our needs when we cooked at home and the provided games near the kitchen table provided added fun and memories for us as well. They really did think of everything to make the stay memorable including providing cute books under the TV to log your memories and thoughts about your stay for others goers to read. The cons: both the upstairs and downstairs beds mattresses are GONE as in no longer good for support. The top master has a foam topper which helps a little bit but two people tend to come together in the middle without trying at night which can be problematic for some people. The jacuzzi tub comes with a sign that says the tank of hot water for it only holds 50-75 gallons of hot water and has a full paragraph about how you need to fill the tub with primarily cold then add hot at the end if you want hot water. This is all fine except it's asking you to fill a 200 gallon tub with only 50-75 gallons of hot water -- I was very disappointed in this as I looked forward to a steamy bath a few nights. The signs explaining the remotes to the TV, how to work the fireplace and how to connect to the internet were great but we found the internet to be turned off (wifi) when we got there and when we called to fix it- the name she gave us to search for the WIFI server was different than the one on the paper. However, in the end we did locate the one written which I assumed had just been turned off. The fireplace instructions were fine but needed to say- "in the event the remote doesnt work check under the lip of the fireplace to turn the on/off switch on so that your remote will work" as the fireplace switch was off for us therefore our remote didn't work and we had to call since we loved this feature. We figured this out too but not after time spent. There needs to be a better way to get new towels then to drive to the main office each time while returning the old. Lastly, we read reviews about bugs in the cabin in the books under the TV but thought they would have solved that issue since the last entry was months before but we found 2 pretty descent size spiders during our stay. One in the bathroom towels that had laid on the bottom level bathroom floor that we accidentally carried up the stairs and another in the tree skirt of the Christmas tree near where I had been sitting on the floor. Just suggest spraying more often as I know the cabin is in the woods and it is to be expected to a certain degree. Otherwise, amazing, amazing time!! Definitely recommend and we would all go back!! I thought the cabin was SUCH an amazing value and great proximity to all the fun things that town has to offer! Relaxing, peaceful Fall weekend at this cabin. The large back deck and lower patio with the porch swing made enjoying the beautiful colors of the Fall leaves relaxing and enjoyable. The close proximity to the Parkway, Dollywood, and all that the area has to offer were appreciated while still being surrounded by trees and feeling away from it all. The gravel road leading to the cabin had some deep ruts/holes (typical) that I had to be careful with in my lower ground clearance vehicle and the driveway gravel caused me to spin my tires a little bit coming up the hill, but no serious issues. A larger vehicle with 4WD would probably have no trouble. Overall a very comfy cabin! Thank you for sharing. The place was very nice, I gave a 7 for amenities due to there was no cookie sheets and there should be at least one, also the toaster was broken. Comfort was given a 7 because the mattresses need to be replaced not just have a foam topper on them and the jet in the hot tub were not really working like they should along with the whirlpool tub in the master bedroom. Beyond those two things I would recommend this place to anyone its was very relaxing there and clean. The staff at cabin USA were very nice and helpful and responded to any needs I had. Would stay with them again. We absolutely loved the cabin! It's beautiful and spacious! The traffic mirror at the end of the road is very helpful! Cabins USA was a joy to do business with! I am so happy to hear that you enjoyed your stay in Blessed Memories! We here at Cabins USA work hard to make sure each of our guests have the same great stay you enjoyed while vacationing in the Smokies. When you are ready to stay with us again, please mention you are a return guest for an additional discount. Thank you again for choosing Cabins USA and we look forward to having you as our guest again! We have booked with Cabins USA several times. I think we have always received the best prices from them. We stayed in Blessed Memories in August of this year. The cabin was great! It is a little older, but well taken care of. I would definitely recommend this cabin to anyone who asks! The only thing I would recommend is that you TAKE YOUR TIME going up the road to the cabin! (and this is in other reviews also). The beds were comfortable, the hot tub great and it even has a sauna (which my son loved!) The Cabins USA staff is so friendly and treated me like one of the family. Check in and check out is easy and they called to make sure that everything was as expected. Cabins USA is a company I will definitely use again! Thank you for all of your kind words and thank you for continuing to choose Cabins USA when you vacation in the Smokies! We work hard to ensure each of our guests have the same great stay you enjoyed and our employees appreciate being recognized for their excellent customer service. Thank you again for your review and we look forward to having you as our guest again soon! We loved the location. Semi secluded yet close to everything in pigeon forge. The cabin was a little dated and the Jacuzzi bathtub didn't work but overall it was a good experience. We definitely would book with cabins USA again! Thank you for all of your kind words! We here at Cabins USA work hard to make sure each of our guests have the best stay possible while vacationing in the Smokies. I apologize for the issues you experienced with the Jacuzzi. Maintenance has been notified and will be correcting that issue. When you are ready to stay with us again, please mention you are a return guest for an additional discount. Thank you again for your review and we look forward to having you as our guest again! I would like to say that our experience was great, we were actually booked in the cabin Top of the Mountain but due to snow and ice on the road up to it we could not make it. We went to the office and without any issues whatsoever, they switched us to Blessed Memories! We will definitely book with Cabins USA again!! The cabin was fantastic, however we were told before hand it was right off a main road we would have no trouble getting to it!! It snowed and we had to leave our car at the main road and walk over a mile to our cabin up the mountain!! So if snow is in the forecast I suggest not staying here cause you can't get to it, but other wise if no snow I highly recommend this property!!! Thank you for taking the time to let us know about your recent stay in Blessed Memories! The snow storm we recently experienced did make it difficult for some of our guests to make it to their cabin and I apologize that you were unable to get your car to your cabin. I have forwarded your comments about the road conditions to our reservationists so they can make future guests aware should we have inclement weather. When you are ready to stay with us again, please mention you are a return guest for an additional discount. Thank you again for your review and thank you for choosing Cabins USA! Loved staying at this place and best moment was bear encounter. Location is nice but it will b really good if the provide milk, coffee, sugar and some green tea. As we came late around 10 and have to go out early morning to get this things for breakfast. I am so happy to hear that you enjoyed your stay in Blessed Memories and were even able to see some of our local wildlife! I apologize for the condition of Joshua Road. Unfortunately, Cabins USA is no responsible for the upkeep of those roads. When you are ready to stay with us again, please let our reservationists know you are a return guest for an additional discount. Thank you again for your review and we look forward to having you as our guest again! This was our 1st vacation in 9 years! This cabin was exactly what we needed. We liked the privacy it provided, the parking was good, the location was great, and the amenities were awesome. We really like the screened in area of the hot tub and enjoyed the large and spacious deck on the main level. Thank you to the owners of this cabin for allowing us to stay here. We WILL be back, sooner than later. Thank you for taking the time to let us know about your recent stay in Blessed Memories and I am so happy to hear that you enjoyed the privacy and amenities the cabin offered. Our reservations are always more than happy to help each of our guests find the perfect cabin for their trip to the Smokies. Thank you again for your review and we look forward to having you as our guest again! We would have had a better time if we weren't both sick!! We were there to celebrate our 24th Anniversary. Nice cabin just wasn't to crazy on how to get to it & pulling out of road!! Thank you for your review. We are sorry to hear you were not feeling well during your stay with us, but we are glad that you did enjoy the cabin. We have had specific traffic mirrors installed for the road for better visibility turning on the road. We hope that we will hear from you again soon. One of the best cabins we've ever visited. The sauna was wonderful and we loved that it was screened in. The beds were comfortable, the kitchen was nice. The game console had very few games. If you're planning on using it, I would suggest renting some games or bringing your own. We plan on staying in this cabin again, but in warmer weather. OTHER THAN LOSING POWER FOR 3 1/2 HOURS WITCH WAS KINDA ROMANTIC HAD A GREAT TIME NO KIDS LOL. Was a wonderful cabin, very clean couldn't ask for anything more, made so many memories can't wait to go back! The staff was wonderful, & a great location, very peaceful & relaxing. I highly recommend staying at Blessed Memories!!! This cabin was wonderful, very comfortable, very clean. We could see the fireworks from Dollywood while standing on the back deck. The air conditioning and ceiling fans kept us very cool. We did miss not having a hair dryer. Always have had a fantastic experiences with CabinsUSA. Minor details with this particular cabin, good thing my hubby brought his toolbox or else we would have had wet clothes. Amazing location! Close to Pigeon Forge and Gatlinburg and Dollywood! Thank you for your review. We are delighted that you had a good stay with us at Blessed Memories. We apologize for any inconvenience, and would have been more than happy to have our maintenance staff assist. Please feel free to call in the future with any issues or concerns. We appreciate your feedback on your stay, and we hope to hear from you again for you next Smoky Mountain vacation. Thank you for your review. We appreciate your feedback on your stay. We apologize if you were inconvenienced in any way. We have had the jets looked at and they are now working. We will have the bed on the upper level inspected immediately. Again we appreciate your review and we look forward to hearing from you again soon. It needed to be more clean of the weeds around the house. the beds need to be replaced. and the driveway needes to.be scraped. Thank you for your review. We appreciate your feedback on your stay with us. We are looking into both issues. We hope that we will hear from you again soon. Do not forget about our return guest discount. Overall our experience at Blessed Memories was positive. The cabin has all the amenities and is comfortable. The cleanliness was an issue. When we entered the cabin there was the smell of cigarette smoke from a previous occupant. Also when we opened the hide-a-bed chips and other food items fell out all over the floor. Both issues were either handled by Cabins USA immediately or were easy to take care of ourselves. We booked this cabin for a relaxing vacation and that is exactly what we received. I would highly recommend Cabins USA and Blessed Memories for your next getaway vacation. Thank you for your review Jeff. We are delighted that you had a great time in Blessed Memories. We apologize if you were inconvenienced regarding of the uncleanliness of the cabin. We are addressing this issues immediately. We hope that we will hear from you again soon for your next relaxing time in the Smokies. The TV's in the 2nd bedroom and game room were not working. We stopped by the office and they sent someone out. The gameroom worked but the bedroom tv still didn't work. The place smelled of bacon the whole time we were there and we never cooked it. Thank you for choosing Cabins USA. We apologize for the inconveniences you experienced during your stay with us; however, I am glad to hear that our maintenance staff was able to come out to the cabin to address the issues. I hope that you will give us a second chance to make your next trip to the Smokies an enjoyable stay. I have recommended and assisted several friends and coworkers thru internet rental for your cabins. Your records will show that blessed memories was my second rental for this year. I began renting from USA when the office was on a side road. My friends all love the properties too. We all plan to rent again during the fall this year. One note for SAFETY- the grill at blessed memories has a rock and RR tie in front of it. Because the grill sets behind the RR tie, there is a possibility of someone (like me) tripping and falling into the grill. This is a poor setup due to the rock not being up against the RR tie and the grill being recessed back a foot. PS-I don't give 10's unless there is a unexpected 'special gift' at the cabin. I rent cabins from the Ky foothills to the north Georgia mountains. I have had rose chocolates to monogrammed terrycloth bath robes (with my last initial) and a few other silly things that gives the renter a feeling that the company really cares. Y'all are wonderful and have been each stay. I have also rented where the ESSENTIALS weren't working and could not be repaired and only got a hassle about a refund. ug! The cabin was actually beautiful. We really enjoyed our stay. If someone could give me some suggestions on a cabin we may see more wildlife we will be back soon! Thank you USA Cabins for a great stay. When I booked the cabin there were no photos available which made me a little nervous. Once we got to the cabin I was thrilled at the property. We are already looking into booking for next year. Hopefully the rates will stay low and we can enjoy another 3 night stay.